Die size hasn’t changed, clock speeds barely went up, and performance per clock also remained static. But what’s this? Ah yes, AMD is improving its 45nm manufacturing process and today we have the latest incarnation of AMD’s 45nm silicon. 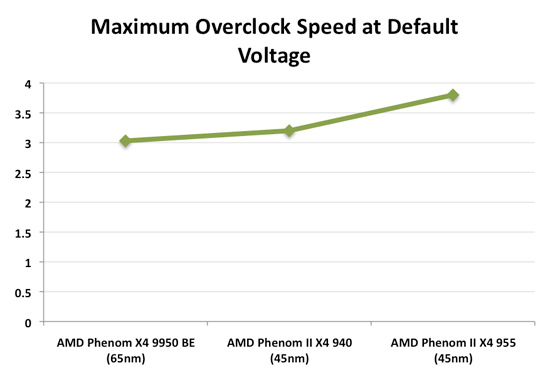 The first versions of AMD’s 45nm Phenom II couldn’t really go much higher than the final 65nm Phenom without increasing voltage. By comparison, Intel’s Core i7 920 could go from 2.66GHz all the way up to 3.80GHz without so much as a single extra millivolt in our tests. 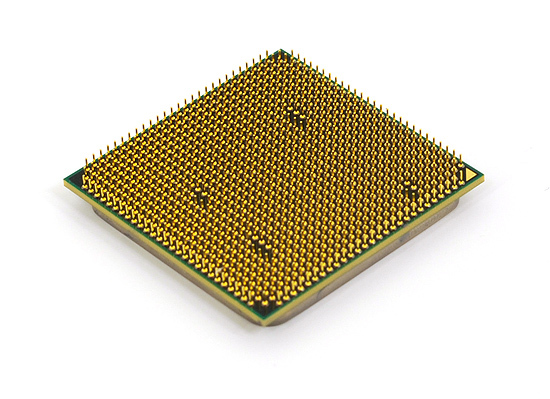 This new Phenom II however can also hit 3.80GHz without increasing the core voltage. At least that’s what one of our samples did in our testing. Whether it’s 3.8GHz or 3.6GHz, the fact of the matter is that AMD’s 45nm process is improving and that’s what’s behind todays introduction of the Phenom II X4 955. Architecturally the Phenom II hasn't changed; if you're curious about what makes these things tick, please look at our original article on the CPU. This is a Socket-AM3 part, meaning it can work in both DDR2 based Socket-AM2+ motherboards and DDR3 based Socket-AM3 motherboards. There’s a huge compatibility caveat about AM2+ support but I’ll address that shortly. 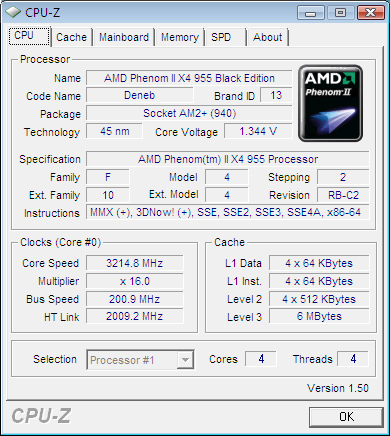 The Phenom II X4 955 is also a Black Edition part, meaning it has an unlocked clock multiplier for easy overclocking. Along with the 955 there’s also a 945 being introduced today. The 945 is identical to the 940 in core clock speed but has a 2.0GHz un-core and is also AM3 compatible. AMD Phenom II X4 910 2.6GHz 2.0GHz 2MB 6MB 95W $??? 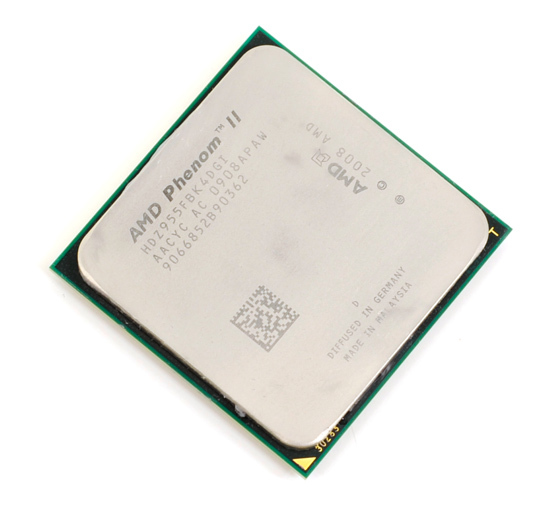 AMD Phenom II X4 805 2.5GHz 2.0GHz 2MB 4MB 95W $??? The prices are pretty attractive; the 955 will sell for $245 (and it already has been) and the 945 will go for $225. That pits the 955 against Intel’s Core 2 Duo Q9550 ($266) and the Core i7-920 ($284), the latter having a much higher motherboard cost of course. And you know how I love spoiling surprises so here you have it. Unless you’re running applications that are very well optimized for Intel’s architectures, the Phenom II X4 955 is faster than the Core 2 Quad Q9550. Compared to the Core i7-920, it loses hands down although the chip does come close in some games. Sorry, I’m not much of a tease :) Now for the rest of the article.